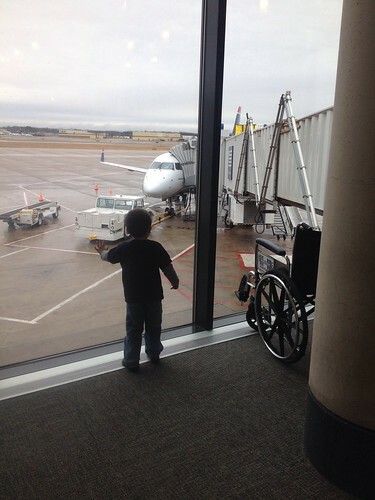 Like a lot of little kids, Ian is a huge fan of airplanes. He's loved our visits to the Air & Space Museum and the New England Air Museum, is always flying his toys around and/or pretending to be an airplane himself, and can spot a plane in the sky no matter how high up and tiny it is. 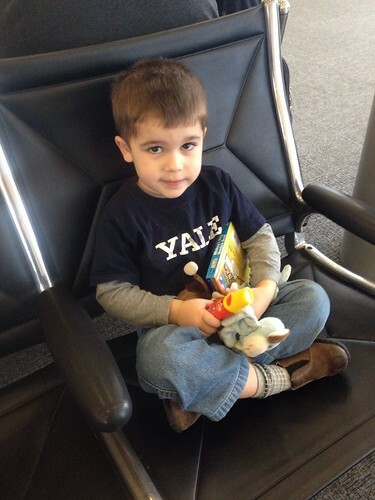 I remember the look of disappointment on his face when we first went to the Air & Space Museum and he got to climb into the cockpit of a Cessna -- I thought he'd love it, but instead he looked crestfallen. "I thought we were REALLY going to fly!" A couple of weeks ago, he finally got his wish. Jim had gone to DC for work for a week, and Ian and I flew down to meet him there. 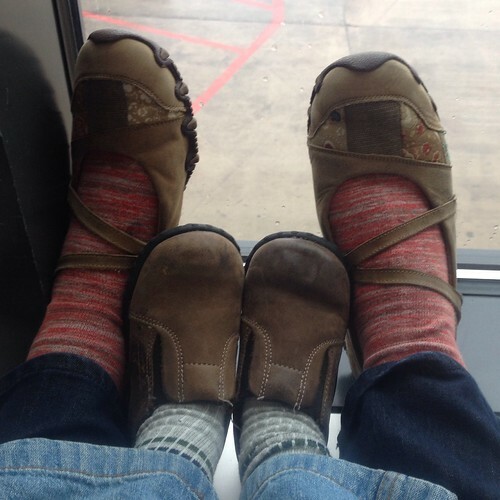 We had gotten to the airport with plenty of time to spare, so we had a couple of hours to wait. We wandered around the terminal a bit, watched a couple of planes take off and land, and then went and sat at our gate. There weren't any chairs right by the window, so we just made ourselves comfortable on the floor. While we were waiting and watching all of the ground crew activity, some of the ground crew guys waved at Ian, which he thought was exciting. "Are they waving at ME?!" Not long after our plane landed and the people from the first leg got off, our flight crew arrived and Ian got to talk to the pilot. And before we knew it, it was time to board. I didn't think it was possible for Ian to be any more excited than he already was...but he was literally bouncing up and down and almost sprinted down the jetway. 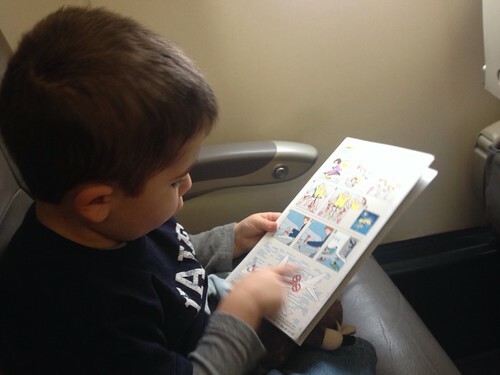 While we waited to taxi to the runway (naturally, they discovered a mechanical problem AFTER we boarded), Ian familiarized himself with the aircraft's safety features and skimmed the in-flight magazine. ...but that's just as well, since it was a cloudy day and there was nothing to see anyway. 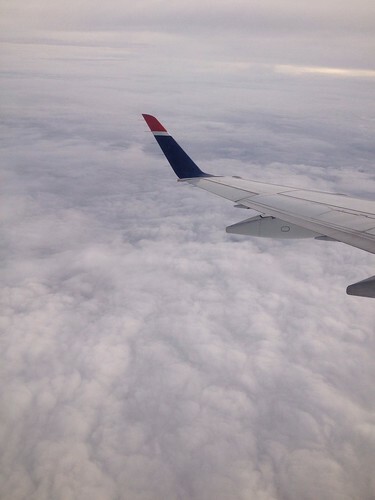 He did enjoy flying THROUGH the clouds, though, and getting to see sunshine and blue sky on the other side. 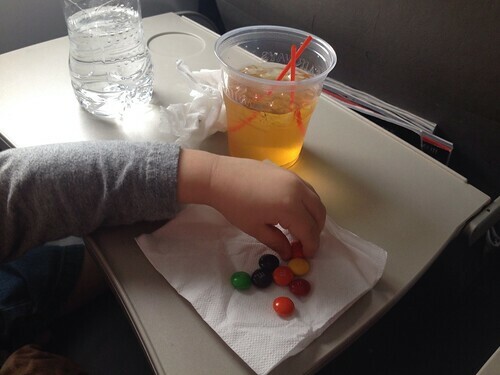 I'd brought along some M&Ms -- his favorite -- as a surprise snack, and our flight attendant slipped him some salty snacks (you know, the ones the rest of us pay $5 for) to go along with his apple juice. 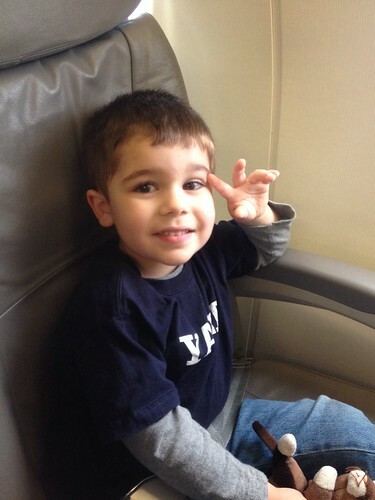 Boy, it pays to be 3 and cute. 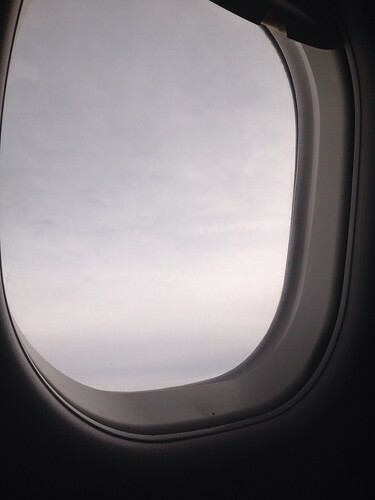 When we were coming in to land, I told him that there would be a little bit of a bump when we hit the ground. 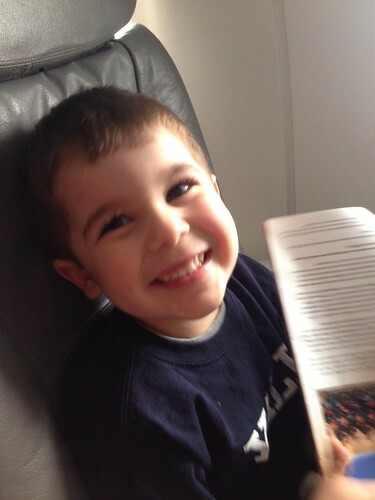 When we landed and then slammed on the brakes, he started giggling uncontrollably again just as he did when we took off. As we were getting off the plane, the pilot invited Ian to see the cockpit and have his picture taken, but he suddenly became Mr. Shy and didn't want to. And after all the time he spent in the cockpit at the Air Museum! Oh well, maybe next time. 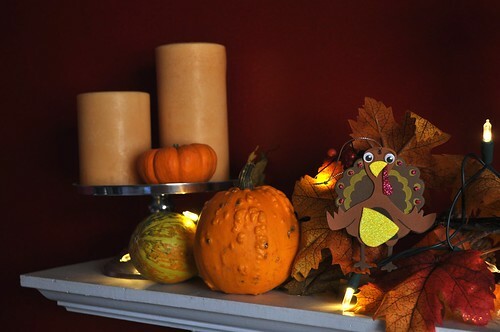 I think that Thanksgiving weekend is my favorite time of the year. It's always just so...cozy. My favorite people, my favorite foods, a nice long weekend, a few days of fun and relaxation...what's not to love? I try very hard to be mindful of all my blessings year-round, not just at Thanksgiving, but it's nice to have a couple of days that are dedicated to thankfulness. And I have so much to be thankful for: I am lucky enough to be surrounded every day by love and laughter and joy and warmth and plenty. I couldn't ask for anything else. Despite the fact that my life hasn't revolved around a school schedule in years, the turn of the calendar from August into September still feels like a new year to me in a way that the actual new year in January doesn't. Summer just always feels...different, somehow, and I've always welcomed the return to the normal routine of the fall and winter. 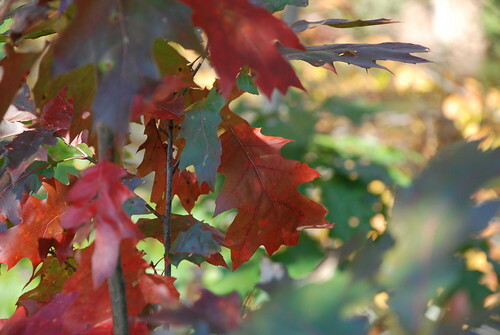 As much as I look forward to autumn, this year I am really having a hard time wrapping my head around SEPTEMBER. This has been something of an odd summer -- we didn't really take a vacation, both of us traveled for work a fair bit, and Jim just started a new job, which meant that the last month or so has been hectic while he overlapped jobs for a couple of weeks, tying up loose ends at the old job while trying to hit the ground running at the new. 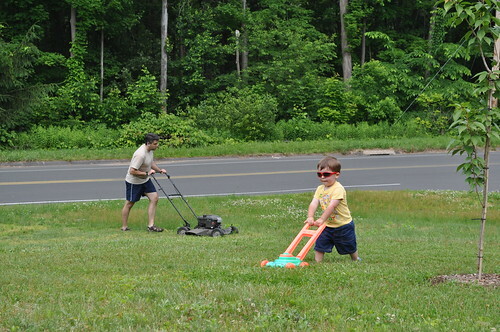 We had a relatively small list of things we wanted to do this summer -- both fun stuff and around-the-house stuff -- and barely made a dent in either. It kind of feels like the last three months just...didn't happen, somehow, because they flew by so quickly. It's odd how we can be so busy and yet feel like we are doing absolutely nothing. He is SO excited about the prospect of taking a bus to school and will tell anyone who will listen that he gets to go on the bus when he is FIVE. 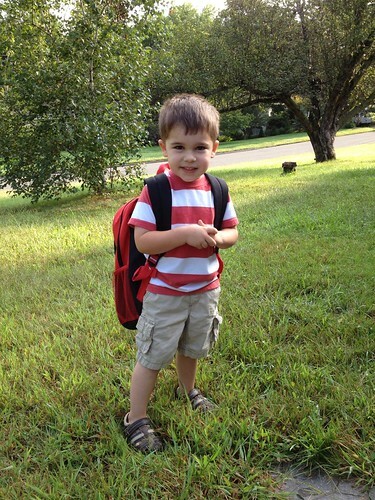 To him that must seem like an eternity, but I know that for Jim and me, those two years before kindergarten are going to go by in the blink of an eye, just like this summer did. I started my new job back in January, and it feels like life has been a big blur since then. Life changes are often a mix of good and bad things, and this move was no different. The job itself is WONDERFUL. I'm the Head of Reference at my new library (I was previously Head of Technical Services) and I think it's a much better fit for me. While I've always enjoyed reference work I thought that being a reference librarian would be too much "people time" for me, being the introvert I am, but I'm actually only on desk 10-12 hours a week, with the rest of the time spent doing the behind-the-scenes things that I enjoy so much; it's a mix that works really well for me. I supervise a GREAT staff and really enjoy my other coworkers as well, and professionally it's proven to be a nice step up for me -- in particular, supervising a pretty sizeable staff is an excellent learning experience for me. It's hard to not spend a lot of time thinking about how much more I used to get done -- both necessary housework-type things and leisure activities -- with those few hours each week that I've now lost to work. I feel like my work-life balance is, currently, tipped more toward the "work" side than I really want it to be. Still, though, it's only four months into the new gig, and so I know I will continue to adjust. I hold out hope that I'll manage to get into a rhythm that works for me. At least now summer is upon us and the daylight hours are long -- it's been making it easier to wake up in the morning, if nothing else! 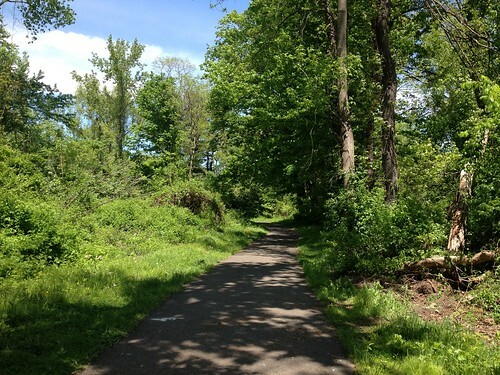 I've started working through lunch and then using my "lunch" break to take a walk instead -- we have a lovely trail loop right behind the library -- and that break in the day is doing me a world of good. I'm trying to figure out how I can work running back into my schedule as well...but one thing at a time. One thing at a time. I am the queen of stress dreams...which is interesting, since I am not someone who generally lets stress get to me. Once upon a time, I had the classic at-school-wearing-only-underwear dreams, but in recent years, they've changed. The setting is still school, and I'm clothed, but I have a math test coming up and I need to pass it to graduate, but I haven't been to class all year and can't even remember where the classroom is. Or I have a concert but have forgotten my band uniform. Or there's a marching band performance but I don't remember the flag routine. Stuff like that. Twice, though, in the last couple of months, I've had a completely new version of the dream -- and maybe it's just a sign of my age, but now the setting is college rather than high school. I'm wandering around campus, and I'm still a student even though it's been YEARS since I was there. Nothing is where I remember it being. I remember which dorm I live in, but I don't remember which room, and I don't have any kind of ID to show my RA so she can let me in (and, of course, she doesn't remember me, since I haven't been there in more than a decade.) And then I go to Todd Union, where the post office was, and I remember my box number and everything, but I don't have a key and I just KNOW there is many years' worth of mail in there, and for some reason it's just really stressful. And now, apparently, I'm subconsciously worrying about the future of the postal service, because last night I had that same dream, with going to get my mail but not having my key. The mailboxes were all still there, but in place of the postal window, there was a bar. But at least I've got my clothes on, I guess? 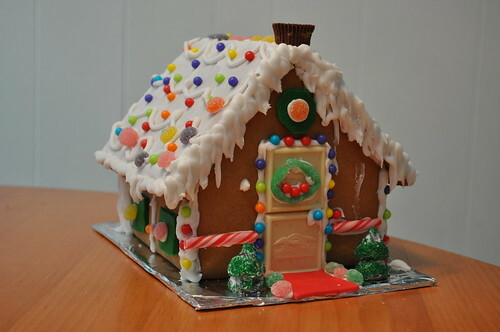 I'm always impressed by gingerbread houses. Every year around the holidays, images of amazingly detailed masterpieces start doing the rounds. I don't have much in the way of architectural or construction skills, so something like that is well beyond my expertise. Basic little houses, though? THAT I can handle. 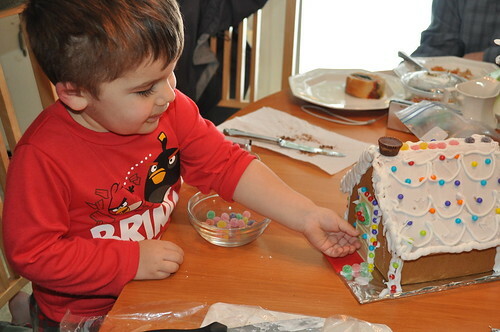 I had thought about doing a gingerbread house with Ian this year, and had spent some time idly looking up recipes and things. But one day we were at Michael's getting some craft supplies and I saw the Wilton gingerbread house kits on sale for $8. Can't beat that price! It came with everything necessary (I was especially happy to not have to make icing! ), including gumdrops and some little round fruity candy things. We augmented with several Hershey's kisses, green sugar sprinkles, a peanut butter cup, a couple of candy canes and two Ghirardelli squares for the front door. It was a fun way to spend an afternoon during that week between Christmas and New Years. 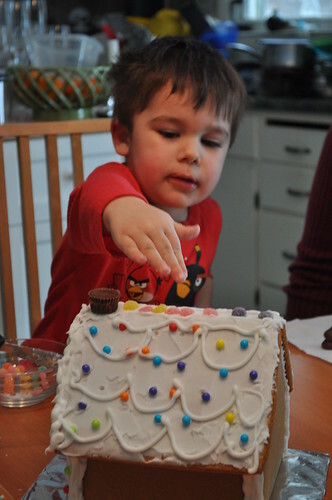 The grownups did the hard parts; Ian stuck on the embellishments. The result was adorable. The question now is, how long do we keep this thing around until we throw it out? I hate to do it, but I also know we can't keep it forever. It's well-documented in photographs, though! December really got away from me this year. For the last few months, I've been involved with a committee for our library consortium -- we've been researching a potential new vendor for our integrated library system software. December was crunch-time -- we had to read literally thousands of pages of system proposals from various vendors, and had bunches of meetings culminating in an intense two-day meeting the week before Christmas where we decided on our top two choices. And in the midst of all of that, I interviewed for, was offered, and accepted a new job (!). My last day at my now-former job was December 21, and so in the midst of all that committee work, I was also trying to wrap things up at my job and get things in order for my eventual replacement. WAY too much going on. So, yeah, December basically disappeared in the blink of an eye. I swear, one day I was thinking "Christmas is more than a month away..." and then all of a sudden it was December 22 and most of the things I'd hoped to do in the lead-up to Christmas just hadn't happened. 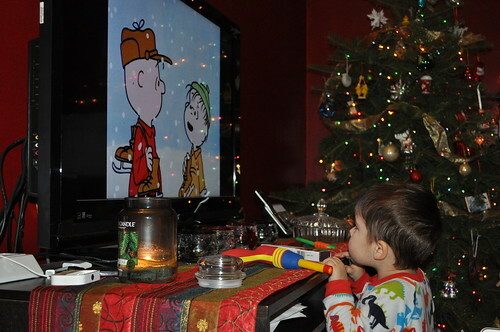 We did get our tree and some other decorations up mid-month, and Santa arrived on time, and we managed to watch The Grinch and A Charlie Brown Christmas, so the important things were in place. As a result, this year I am fully embracing the Twelve Days of Christmas idea. I am still in Christmas mode until January 6 (and I start my new job on January 7, so the timing is excellent). Today Ian and I did a couple of the little projects I'd hoped to do before Christmas. Tomorrow we'll bake some cookies before ringing in the new year. I still plan to do handprint ornaments with him at some point. I bought more eggnog at the grocery store today. And I'll be posting some more about Christmas in the next few days (assuming I keep myself motivated) -- so those of you for whom the holiday is OVER on December 26, consider yourselves warned! I love when I wake up and it's fall! I firmly believe that if I were prone to seasonal depression, I'd get it in the summer. Yes, there are things that even I, hater of hot weather, like about summer, but I can really feel myself springing back to life as the days get shorter and the nights get cooler. Once I start thinking about cooking again (I basically don't cook between about June and mid-September) I know that it's really fall. I love the cocooning season and I'm so happy to have it back again! 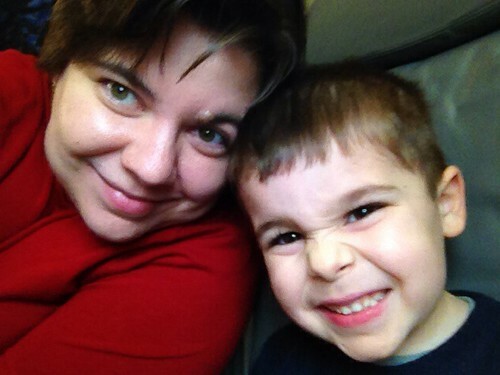 The last few weeks have been busy -- lots going on, both at home and at work, so I've been remiss in writing here. I still keep a paper calendar -- I have yet to find any sort of electronic or web-based calendar that works well for me -- and, for the first time ever, I feel like I would really be up a creek without a paddle if I lost it. For a very long time I prided myself on being able to keep pretty much everything in my head, with nothing but the stray appointment card stuck to the fridge as a reminder for something that was several weeks out, but those days are over now. It had to happen sometime, I suppose. I have filled out my annual overambitious fair entry form. I have one thing that is definitely done and ready to be entered, and another where all the individual components are done but the project needs to be assembled. Why (or how) I think I can finish three additional things between now and next week is beyond me, but, well, we'll see how far I get. It's a single entry fee whether you enter one item or a hundred items, so at least this way I have my tags reserved, and if I don't use them, oh well. One of these years, I'll start thinking about Fair projects earlier in the year, rather than right up at the entry deadline. I'm currently reading The Destiny of the Republic by Candice Millard, about the assassination of President Garfield. I started reading it sort of on a whim -- it had been on my to-read list for some time, but I had no particular plans to read it anytime soon. But I was browsing our library Overdrive catalog, looking for something to load onto my Kindle, and saw that it was available, so I checked it out. I am really, really enjoying it. It reminds me very much of Erik Larson's books, which is a good thing as he's one of my favorite writers and I've already read everything by him! I find myself really dreading the inevitable as I'm reading. I knew next to nothing about Garfield before starting the book (I think my knowledge could pretty much be summed up as "he was President, he had a beard, and he was assassinated") but he's jumped right onto my list of Historical People I Would Love To Have Over For A Dinner Party. I might cry when the book finally reaches his death. Anyway, because I'm SURE you've been waiting with bated breath....here are the pictures I promised you. 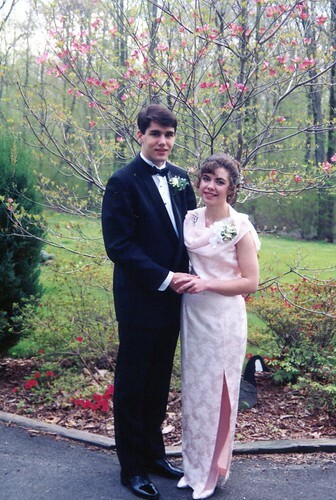 First up, senior prom 1995, very soon after we started dating. I have to tell you, I LOVED that dress. It made me feel like a movie star. I would totally still wear it today, but I assure you there is no way that I will ever again fit into a size 4 column dress. Oh, to be seventeen again. And a bonus picture, from around the same time. I can't remember when, exactly, this one was taken. 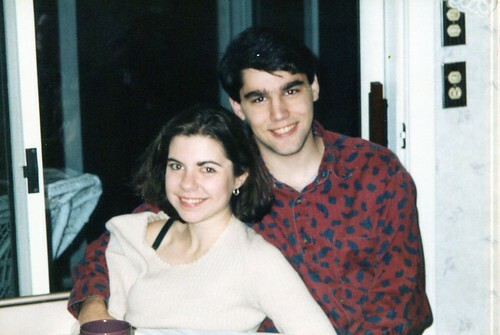 I feel like it was over Thanksgiving in 1995, based on my haircut and the fact that we're wearing long sleeves, but I'm really not sure. Aging is such a weird process. I don't feel any older than I did then, but boy, am I. We were such babies! Fathers Day was completely off my radar for a good many years, to the point where I could barely remember what month it was in. But now we celebrate it again, of course -- and Jim gets it all to himself, since he's the only dad in our midst. I always knew that Jim would be a good dad -- it was easy to see from how he was with other people's children and, as stupid as it sounds, with our cats. And I'm glad to note that he hasn't disappointed yet. ;-) Ian's very lucky to have him for a daddy, and I'm very lucky to have him as my partner in crime. I always forget -- until it comes around again -- just how busy I always am in the spring! This year has seemed even crazier than usual, though, for some reason. And to think that Ian isn't in school, so we don't even have end-of-the-school-year craziness (or, really, much of anything that is Ian-centered) to add into the mix. Yet. Knitting: Is, at the moment, not happening, but since last we spoke I did knit a Wingspan shawl (though mine is more scarf-sized) and I liked it so much that I started another. 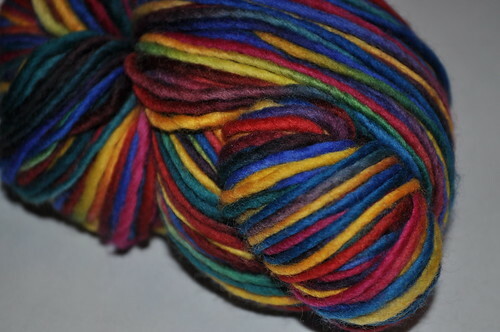 And I sold a little bit of yarn from my stash (thanks to people asking nicely on Ravelry!). That's about all the yarn action that's happened around here. I didn't go to Maryland Sheep & Wool; I thought about Massachusetts Sheep & Wool this weekend but couldn't work up the motivation. Reading: I'm still on pace to make my 52-book goal for the year! I love the Goodreads widget that keeps track of my progress for me. (As of right now, I'm one book ahead.) I read a couple of prepub books on my Kindle (thanks, Netgalley!) that I really must review; and Book Expo America is coming up next week! I won't be lacking for things to read, that's for sure. Even my husband is getting in on the book review action -- the only difference is that, assuming it meets their specifications, HIS is going to be published in an actual print publication that you've probably even heard of (he's frequently published in places you HAVEN'T heard of). Ah, the benefits of being practically-a-PhD and Knowing People In Your Field. Anyway, right now I am still working on book 2 of the Game of Thrones series -- I had every intention of keeping ahead of the TV show, but that didn't happen. Oh well. I let it languish for a while, but over the last couple of days I've been picking up speed on it. Maybe I'll manage to read Book 3 before Season 3 starts! Work: Is crazy. I've been serving on a task force for our library consortium, which has necessitated all kinds of demos and webinars and a lot of driving around to different libraries. Plus, spring is Conference Season, between the Book Expo and the CT Library Association conference and a few smaller other things. AND I've been teaching a lot of classes at the library. Between all the time out of my office and the time I've been devoting to preparing for, and teaching, my classes, I feel like I barely have even touched my "normal" job responsibilities lately! And now summer reading is upon us...woohoo. Running: Yes, you read that right. Running. I started up a couch-to-5k program again. I've started (but never finished) a program multiple times over the last few years; I think the last time was the summer I ended up getting pregnant, and when it got really hot I used that as an excuse to quit. For whatever reason, I seem to be much more motivated this time around. Today I did week 4 day 2 (there are eight weeks, 3 days per week) so I'm nearly halfway through the program. It's starting to get difficult for me...but I guess that if it took four weeks for it to feel like a challenge, that's a good thing. Right? Family: Our big family news is that my sister Kayte finished her RN! YAY! She's been going to school while also juggling multiple jobs, multiple sclerosis, and single-motherhood, so it was a long time coming, but she is finally DONE and she just found out a couple of days ago that she passed her state boards, so it's all official and everything. I am just so proud of her I could bust. I even got to go to her graduation: the last time (when she got her LPN) I was just days from delivering Ian, so opted not to drive all the way to New Hampshire for the ceremony. Gardening: My perennials all came back (except for, oddly enough, the coneflowers -- I would have thought they'd be pretty indestructible) and have spread well and are just generally doing quite well. Yesterday I bought some plants and some seeds, and Jim got the vegetable garden all planted. There are a few more odds and ends we want to add to the vegetable garden, and I'd like to add a few more flowers to the perennial beds, but everything is in good shape for this summer! I think that's all the big stuff. You see why I've had no time or inclination to blog! Ian has a new chore/favorite thing to do: he feeds the cats in the morning. 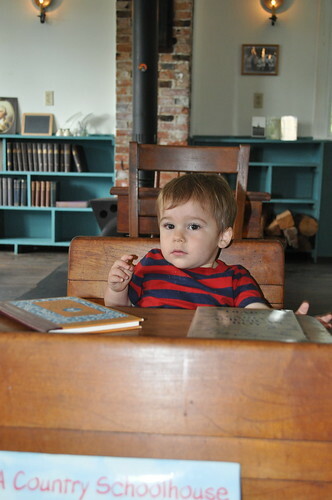 I started thinking quite a long time ago about what would be good chores to have him do once he was old enough, and feeding the cats seemed like it would be right up his alley. So for months now, I've made it a point to try to have him around when I feed the cats so that he could see the procedure, and this week he decided (of his own volition, even!) that he was ready to take over: one morning as I was opening up the catfood container he came barrelling into the kitchen. "NOOOOO! Eee-eh do it!" And that was that...it's now HIS job. :-) And I find it funny, how quickly the cats have acclimated to this slight change in routine: Gandalf now meows incessantly at Ian every time he walks into the kitchen, and this morning the cats woke me up at exactly the same time Ian normally wakes up, rather than starting in around 5am with the "feeeeed us! we are poor starving babies!" routine. Strange side effect of motherhood: I'm on much more of an internal schedule than I used to be. I only need to set an alarm in the morning when I need to be up MUCH earlier than usual, and I apparently cannot sleep in anymore: even with Ian gone, I was up before 8 this morning. In days gone by, I would have gotten up, fed the cats, and gone back to sleep. Not now, though. WHO AM I? I should have spent the morning being productive, but no. Relaxation is good, I know, but I lost a day on Friday to being sick and I have a busy month ahead of me, so I need to Get Things Done. This picture is cheating: it's from mid-April 2010, just before Ian's birth. With this spring's unusual weather, I was looking around for pictures from previous springs to see when things were blossoming. 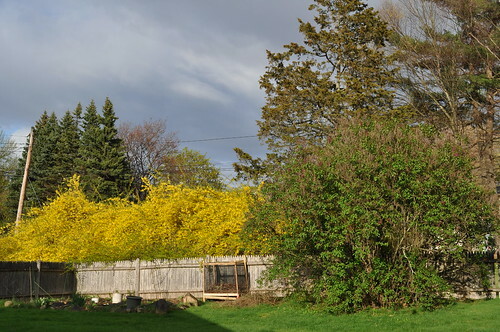 We had a week of 80-degree temperatures, and so around here most of the flowering trees have already blossomed, and our forsythia is already well past the degree of bloom in this picture. I feel like April is going to seem kind of colorless with so many of the usual April/early May blooms already passed -- or will our return to colder weather make the flowering season last longer? And then there's the question of my lilac: the October snowstorm decimated the poor thing, and I've been waiting anxiously to see whether it survived enough to regenerate somewhat. I took advantage of the weather two weekends ago to do some work outdoors -- I got my perennial beds cleaned up and pulled last year's plants out of the garden. I'm really sort of flying by the seat of my pants with this whole gardening thing -- I really don't know what I'm doing, so I just do what feels right. ;-) I need to augment the perennial beds this year with something that blooms later in the summer, and we need to decide what's going in the vegetable garden this year. It was nice to have that bout of nice weather to get a headstart on the spring cleanup, so once planting time arrives we can dive right in! It's been difficult to remind myself over these last few days that it's really only March! Sometimes we'll get one randomly warm day in the very early spring, but a week of 80-degree temperatures? Unheard of! I wore sleeveless dresses to work these last two days....something I usually only do during July and August. Crazy. We didn't have much of a winter, truly. I mean, yes, there was the giant storm at the end of October, but that was pretty much it. We only had one real snowfall to speak of, in mid-January -- the day my grandmother came home from the hospital for the last time. 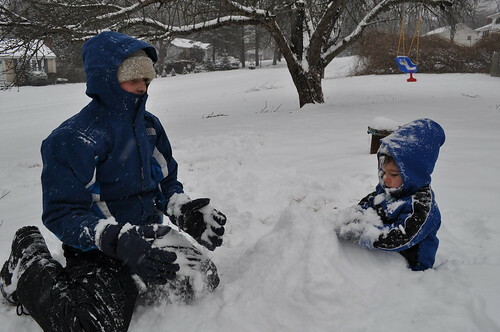 The good thing was that since we were all gathered for that, our nephew Thomas was here -- which meant that he got to introduce Ian to playing in the snow. Who better to do it? 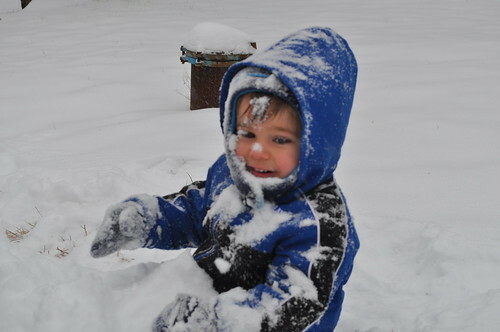 Ian LOVED the snow. He seems to enjoy the cold -- even last winter when we went to Vermont when he was about nine months old, we noticed that he was all smiles whenever we went outside into the frigid temperatures. Jim is beside himself with anticipation for next winter (or maybe the winter after that, if I get my way) -- he's been looking forward to teaching Ian to ski since, well, since before I even was pregnant with him. :-) I, however, am less thrilled about the prospect. I'm no fun. 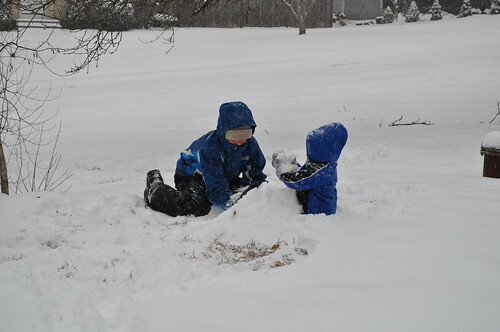 Sadly, this was pretty much it for snow play this year. We had a couple of other light dustings which he got to toddle around in, but there wasn't really another snowfall that lent itself to playing. While we didn't get much snow, it was just chilly enough for a nice warm hat -- and luckily, Ian loved the one I knit for him. Needles: US7, I think? I didn't write it down! This was a quick knit, obviously, being a tiny little hat. It only took me so long because I ripped it out and restarted it at least three or four times -- it took quite a while to find a combination of size, fabric, and pooling that I found satisfactory. I'd like the pooling, but the hat would be way too big. I'd like the size, but the pooling was funny. Different needle size led to a good size, but the fabric was way too stiff....you get the idea. I finally found a combination I was happy with, though. I neglected to mark down which needle size finally worked, but I wound up casting on 84 stitches and working the pattern in multiples of 6 stitches instead of 8. And, obviously, I left off the pompom. Other than that, though, I followed the pattern. 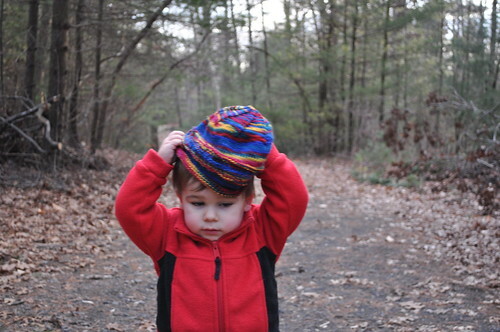 Ian LOVED this hat, insisted on wearing it everywhere, and I think it will still fit him next year, too. Hopefully he'll still like it! I didn't really set out to knit my one-year-old a hat out of a $25 skein of Malabrigo (I'm generally all about the easy-care yarn for kid knits), but when I saw these colors I just couldn't resist. 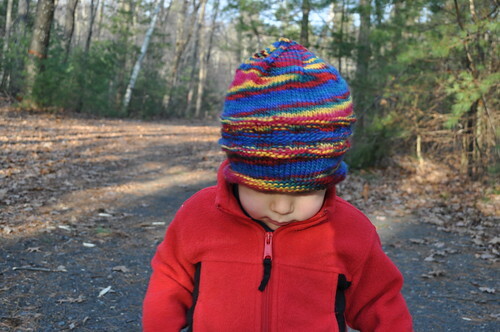 What a perfect, bright, happy colorway for a little kid....and, of course, it's super-soft for his noggin. I had woolly things I kind of wanted to get to this winter, but now it's time to think ahead to spring and summer knits. Of course, I'm certain we'll get one more snowstorm before we're truly 100% into spring. Maybe over Easter -- it would be an appropriate counterpoint to the Halloween storm! Growing up, I always thought of my grandparents -- my father's parents -- as being REALLY old. And, well, they were...if they were still alive, they'd be turning 99 and 104 this year. And they were much older than my other set of grandparents. 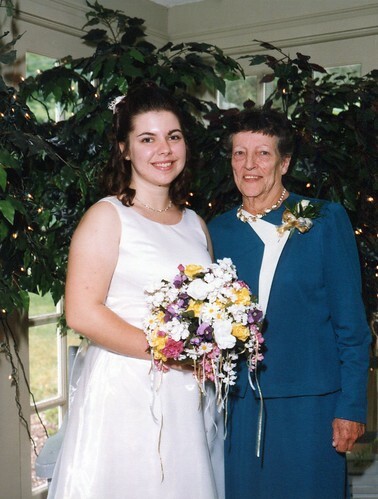 So it was a surprise when I realized, about a month ago, that my grandma Moosie, the youngest of all my grandparents, was, suddenly, my oldest grandparent -- she'd outlived all of the others and was older than even my dad's father had ever been. Today would have been Moosie's 88th birthday. But she missed it by two weeks -- after declining steadily over the last six months or so, she died on January 22. She'd gone to the hospital just a week before she died -- she was having trouble breathing -- and it was pretty clear that she was at the end. She came home on Saturday afternoon and died just about 25 hours later, quietly, just like she lived. It was peaceful, in the end. My mom and my uncles, my sisters and my cousin and I were all with her. 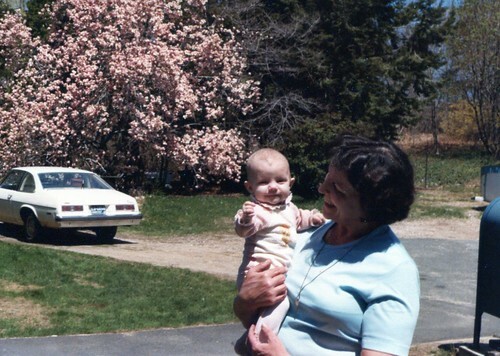 It sounds so trite to say, but truly, there is no one quite like a grandma. It's so difficult to put into words everything that she meant to me, and I find myself simply lapsing into snippets, anecdotes, about her life and about our time together. There are so many things I will always remember: Going on walks with her. Her oatmeal cookies and her homemade chow mein. The letters she wrote me while I was away at college. The summer during college that I lived with her, when she insisted on packing my lunch every day before I left for my job as a day camp counselor (and would sometimes even send me in with a batch of cookies to share with the kids at camp). The many nights at her house playing cribbage and Scrabble -- sometimes just the two of us, sometimes a whole lot of us. How she took me out driving, when I turned 16 the winter after my dad died, because my mom was too scared to do it herself. Her delight in her great-grandchildren. How she took me shopping, the week before my wedding, to help me find a pretty barrette to put in my hair because I wasn't planning on wearing a veil. I could go on and on. There are a million memories, and yet they aren't enough. They could never be enough. When you love someone, it doesn't matter how much time you spend with them -- you always wish it could be longer. Moosie lived a life that sounded like something out of a storybook. She was orphaned twice as a young child, and eventually was taken in by an elderly aunt and uncle. 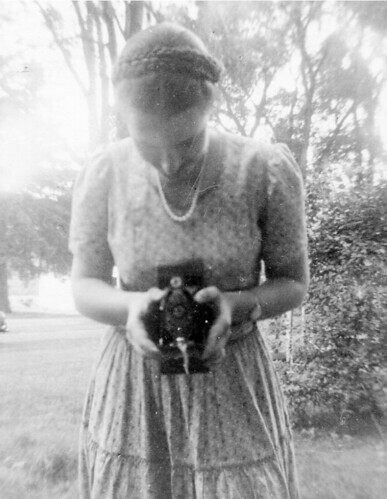 She met my grandfather during World War II when her cousin suggested that she write to a nice young man from Louisiana that he'd come to know -- they wrote throughout the war, he came to Connecticut after he was discharged, and the rest is history. She ran our town's post office out of the back room of her house from the late 1960s until the mid 1980s. I always loved to listen to Moosie's stories about growing up, particularly because I, too, grew up in the same town. It always seemed vaguely preposterous that we'd grown up separated only by fifty-four years, because her childhood seemed SO different from mine. She told stories about doing things like sledding down the road in front of her house. Even then it was the main road in town -- but then it was a quiet country lane, and now it's a state highway with a 50mph speed limit. She went to a one-room schoolhouse and then attended high school in an adjacent town, since our town didn't have its own high school until the 1960s. Moosie also did a ton of crafts, as did most women of her generation. She sewed a lot, and could knit and crochet (though she didn't enjoy either and I don't recall her ever doing either, although she must have at some point because a few years ago she gave me a bunch of crochet hooks and knitting needles), but mostly, at least in the years I knew her, she did rug braiding, shuttle tatting, and chair caning...three things that fall into the category of "things no one can do anymore." I'm tremendously sad to say, though, that I didn't learn any of these things from her. She tried to teach me to tat several times, but I just literally could not wrap my fingers around it (I think that now that I'm a good knitter, it would probably make more sense to me -- I must find someone to teach me!). Chair caning was something I wanted to learn -- but by the time I had the time and the inclination to learn, her eyesight had deteriorated enough that she couldn't really do it anymore. The same with rug braiding -- I don't know when exactly she gave it up, but she already had by the time I was ready to learn. Still, though, despite the fact that I didn't pick up those three particular things (though I intend to learn someday! ), I learned so much from her. She taught me how to sew and mend, and the values of having a button collection and various notions handy at all times, and she always loved to try out new things -- something I definitely picked up from her! In her later years, even after she had to stop doing handwork herself, she always loved to see what I was working on and talk shop with me. For many years, she demonstrated chair caning at our town's historical fair, and I like to think that now, as I demonstrate spinning there, I'm following in her footsteps. One thing my family is lucky to have is a LOT of pictures, going back into Moosie's childhood and even earlier. We've all been going through them over the last few weeks. I scanned a lot of them for a display at her memorial service, and have continued going through and scanning others so that we can have a digital repository and share them amongst our family members. I leave you with one of my favorite images we found -- Moosie, from sometime in the early 1940s. I love how beautiful and ethereal, somehow, she looks in it, and I love that it's not a typical posed photo. It's so like her -- always doing something with her hands. Happy birthday, Moosie. I love you and I miss you.